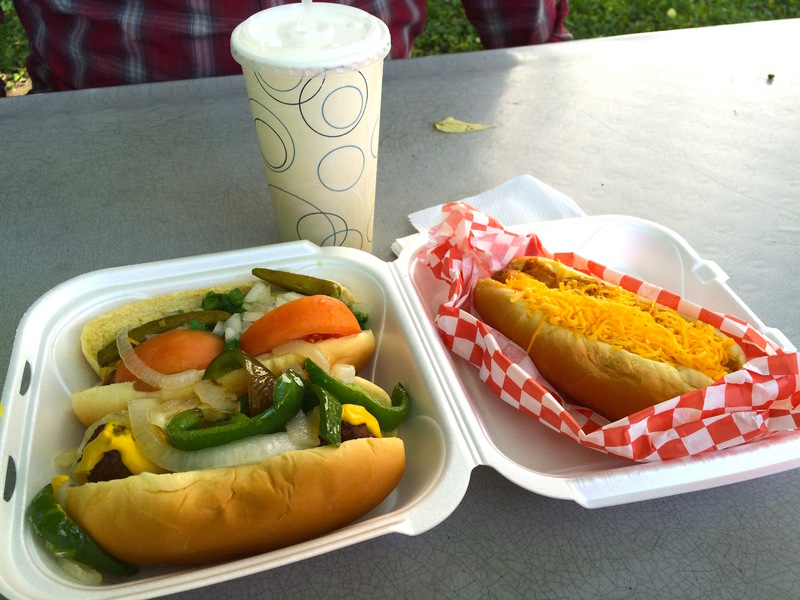 Mr. Gene’s Dogs – Go There. Try That. My dad’s name is Gene and he loves hot dogs. I mean LOVES hot dogs. If he sees a hot dog stand somewhere, that’s all he needs to be happy. Give the man a hot dog, a bag of chips, a small drink and he is golden! There were plenty of times as a teenager I rolled my eyes over “lunch” at a hot dog stand. So finding a hot dog place in Cincinnati called Mr. Gene’s Dog House, well, how could I pass that up? 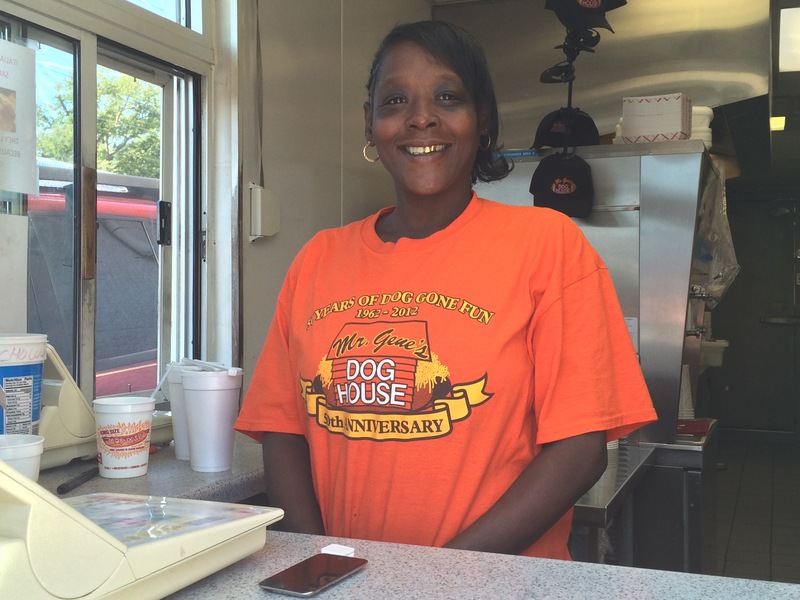 Turns out, Mr. Gene’s Dogs House, which serves all beef hot dogs, is a Westside staple! This place has been in business for 53 years (three original employees are still working there)! It might not look like much on the outside, but there was a line of customers both when we arrived and when we left. Now that is a positive sign for people like me who love to try new places. When I go to a place I’ve never tried before and the parking lot is empty, I get a little nervous. That is definitely not a problem at Mr. Gene’s! 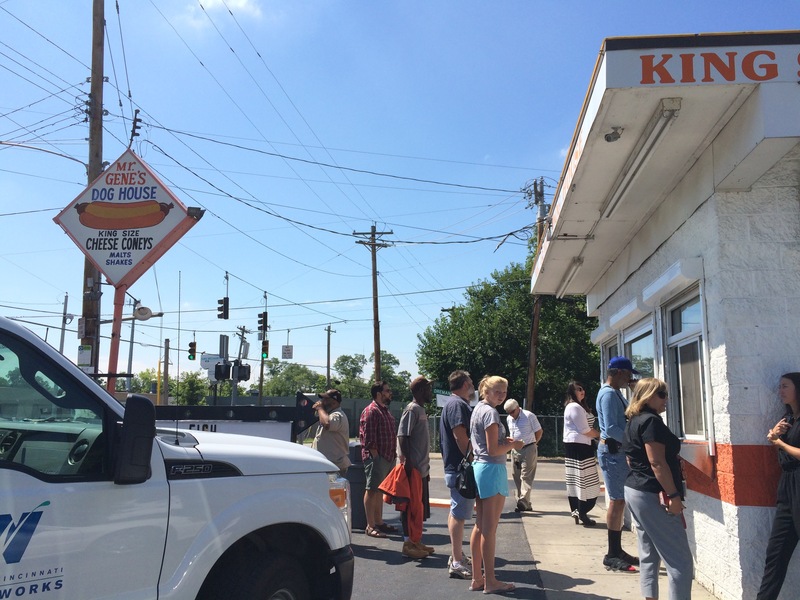 Before arriving, we heard we needed to try a Chicago dog and pineapple milkshake. Beyond that, we relied on other customers to help us complete our order. 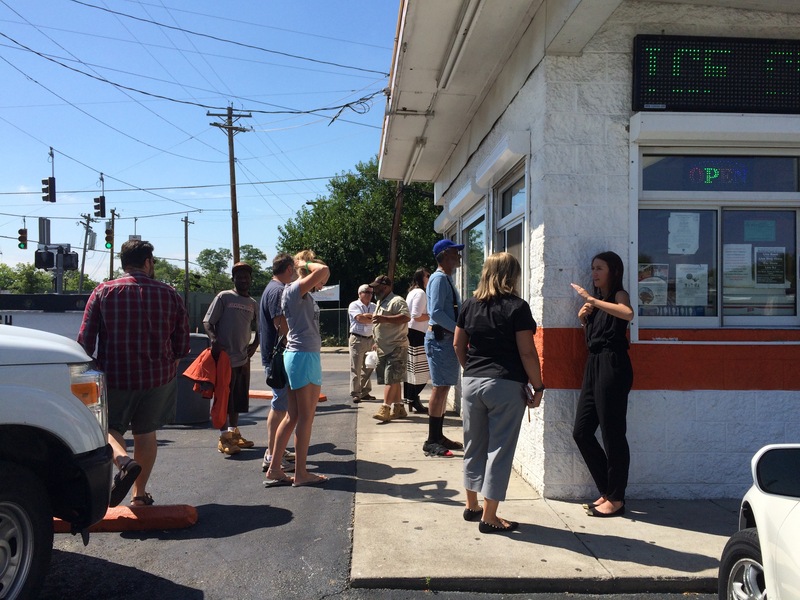 Having never met a stranger, I simply asked several different people in line what they loved to eat at Mr. Gene’s. And, speaking of customers, there are all different kinds of clientele here- business men and women, city employees from various companies, and locals from the neighborhood. Another positive sign! Since it was our first time, we were told to get a Chicago-style dog fully loaded, a hot style chili cheese mett, and an Italian sausage, again, fully loaded. And of course, that pineapple milkshake! 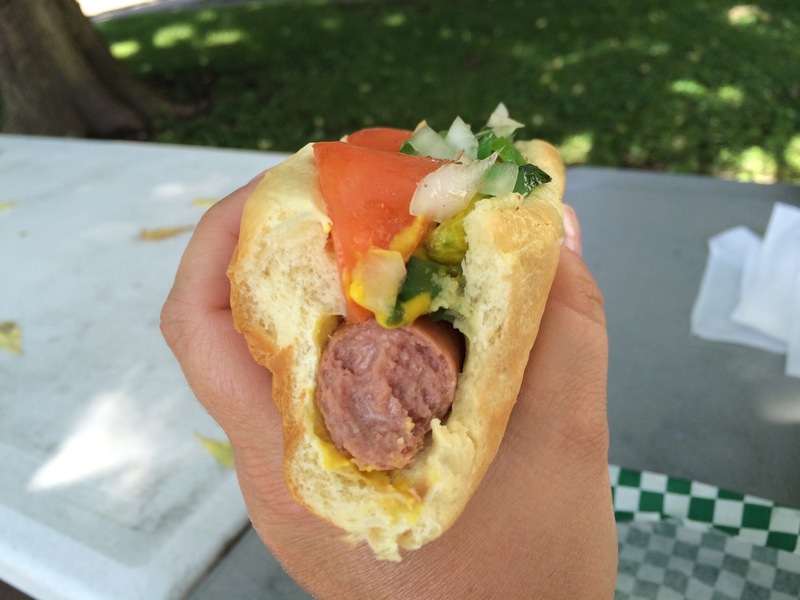 My two favorites were the hot chili cheese mett and the Chicago-style dog! First of all, the mett itself was really good. However,what really surprised me, and here is where I hope I don’t get virtual rotten tomatoes thrown at me, I’m not a Cincinnati chili fan, and Mr. Gene’s chili is not sweet- in fact, it’s a little spicy and I much prefer that. 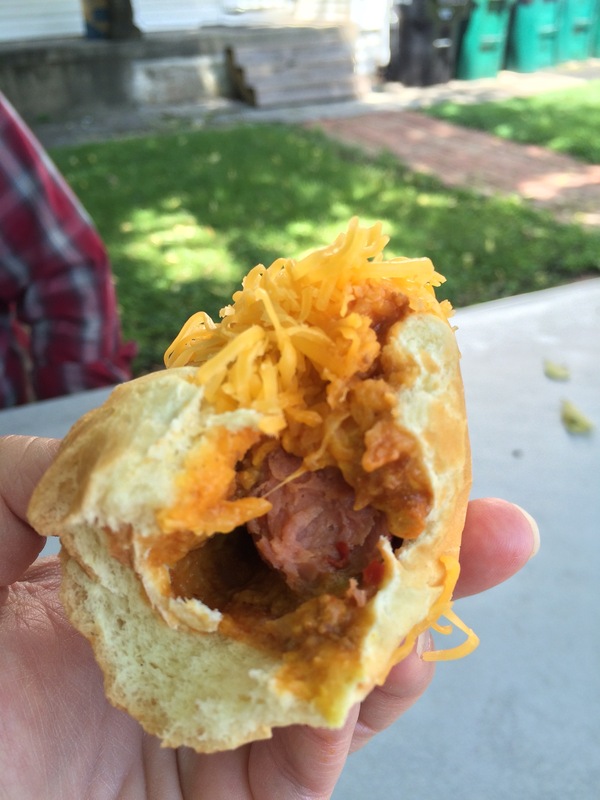 So while I didn’t expect to really love this chili cheese mett, I did! Plus, you can order mild or spicy and I loved the kick the spicy mett provided with the cheese and chili. My favorite though was the Chicago-style all beef dog! This bad boy comes with mustard, onion, bright green relish, tomato slices, and an ENTIRE dill pickle spear…and entire pickle…as part of the sandwich! None of this was pretty to eat (grab some extra napkins people), but it’s really good! And that pineapple shake? Definitely delicious! Creamy, sweet, and fresh! After you place your order, you wait for it at the next window and either eat at one of the picnic tables out back, eat in your car, or take it to go. No indoor seating. Nothing fancy here and it doesn’t need to be. Mr. Gene’s is open seasonally, February 15ish through the first week of November! So stop in soon! 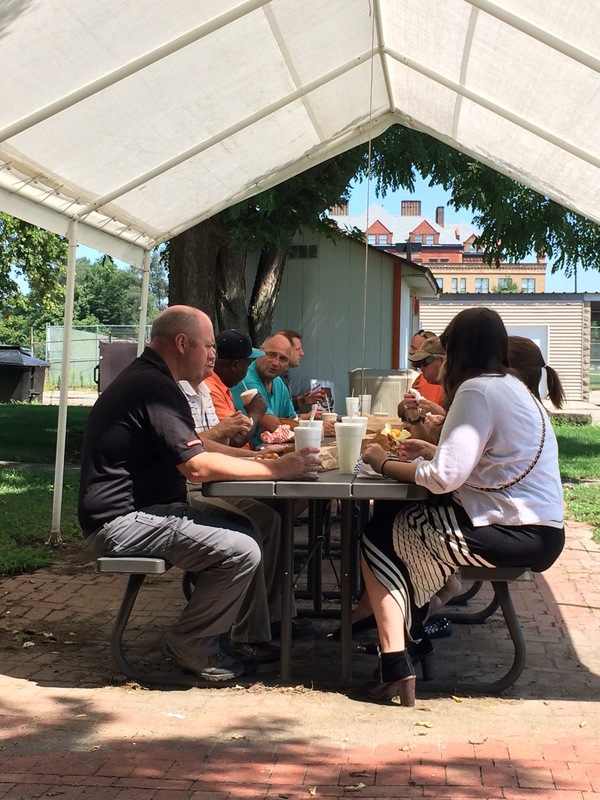 This is the perfect time of year to stop by and grab a fun, inexpensive bite to eat! And everyone is friendly! 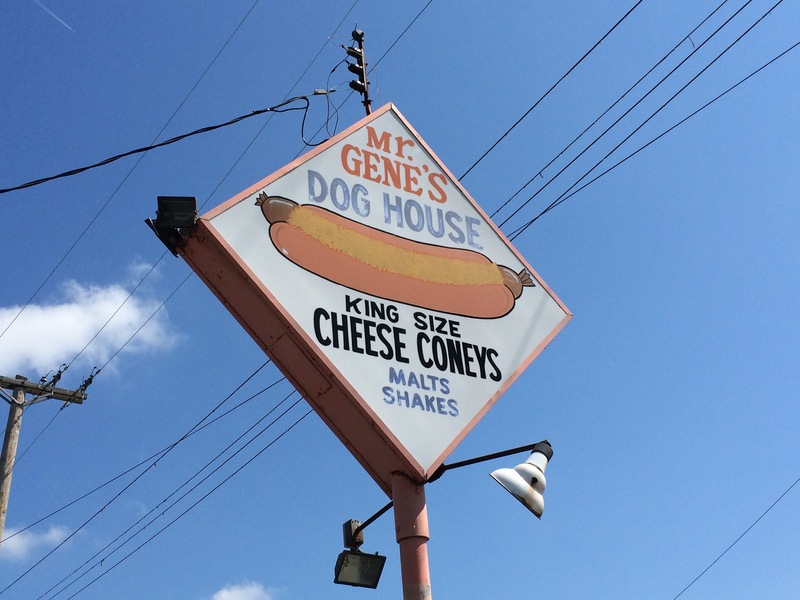 GO THERE (Mr. Gene’s Dog House)! TRY THAT (Chicago-style dog fully loaded, pineapple milkshake)! Dad says thats where he wants to go next time he comes to Cincinnati. Wow this is so cool. Cannot wait to get out and try it! !